The British Fourteenth Army was a multinational force that took part in the Burma Cam­paign (January 1942 to July 1945). Units were drawn from the British Army and the Indian Army, with signi­fi­cant con­tri­bu­tions from Ghurkha and West and East African regi­ments. The Four­teenth Army has often been referred to as the “For­got­ten Army” because its theater of oper­a­tions had long been written off as a “side­show,” since fighting there did not con­tri­bute to the defeat of Japan. For most of the Army’s exis­tence, it was com­manded by Lt. Gen. William Slim, one of the most extraor­di­nary gen­er­als of his ge­ner­a­tion. 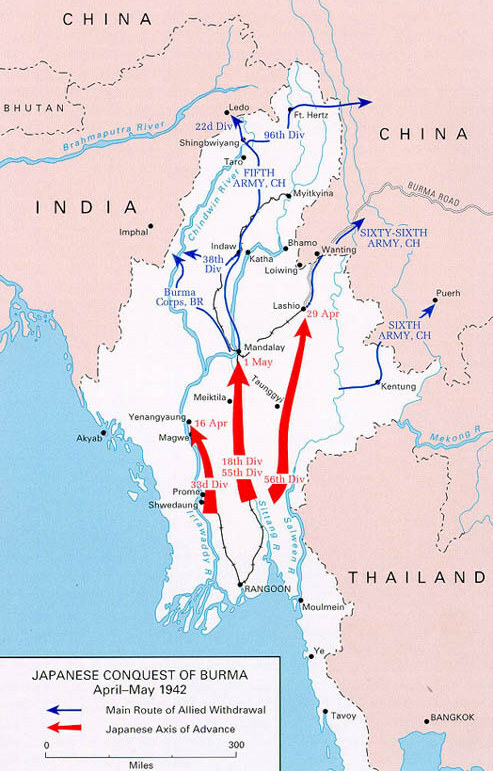 After the March 7, 1942, fall of Ran­goon (or Yang­on), capi­tal and port city of the Brit­ish colony of Burma (also known today as Myan­mar), the Allies attempted to make a stand in the north of the coun­try. Oper­a­tions in upper Burma over the remainder of 1942 and 1943 were a study in mili­tary frus­tration due largely to the “Ger­many First” approach adopted by policy­makers in London and Wash­ington. In 1944 the Japa­nese army in Burma attempted to invade British India (the Imphal and Kohima cam­paigns named after two small towns that were home to British front­line garri­sons). The Imphal oper­a­tion, when finally broken off early in July 1944, was the greatest mili­tary defeat on land to that date in Japa­nese history, a defeat brought on partly by dis­ease that ravaged Japa­nese ranks and partly by superior Bri­tish intel­li­gence. On this date in 1945, after a four-day fero­cious battle, Gen. Slim’s Four­teenth Army took the central Bur­mese town of Meiktila, an im­por­tant line-of-commu­ni­cation center for the Japa­nese. Man­dalay, the old royal capi­tal of Burma, was the Four­teenth Army’s next objec­tive, and it fell on March 20, 1945, though the Japa­nese held the former cita­del, called Fort Dufferin, for another week. Much of the his­torically and cul­turally signi­fi­cant portions of Man­da­lay were burned to the ground in scenes remi­nis­cent of the des­truc­tion the Japa­nese in­flicted on the Philip­pine capital of Manila in the same month. Between the two Bur­mese battles, Meiktila and Man­da­lay, most of the Japa­nese forces in the British colony were destroyed, allowing the Allies to later recap­ture Ran­goon, which the Japa­nese had eva­cu­ated, and reoccupy most of the country with little organized opposition. routes of withdrawal, April–May 1942. 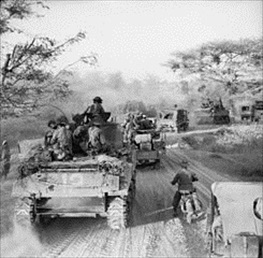 Right: Men of the British Indian Army (6/7th Rajputana Rifles) advance behind Sherman tanks during the assault on Meiktila. Over­coming immense logis­ti­cal pro­blems, Slim’s armored dash behind enemy lines seized Meiktila, cutting Japa­nese supply lines. At the end of March 1945, the spent Japa­nese 15th Army with­drew south, leaving Ran­goon to the British on May 2–3, 1945, while making their way east to Thai­land. 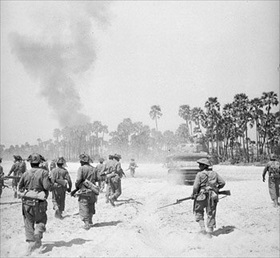 On Septem­ber 12, 1945, the British accepted the sur­ren­der of 680,000 Japa­nese soldiers still left in Southeast Asia.